Tired of looking for a rock to place your kickstand down? Our Kick-Ashe will keep your ride up! 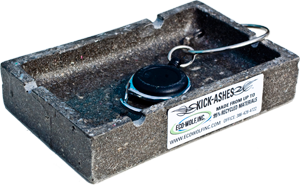 It's made from 95% recycled material so it's GREEN, virtually indestructible, and safe for use as an ashtray when not holding up your bike! Limited Lifetime Replacement Warranty with reasonable use.